These promotional teardrop custom flag banner are used to make huge impact and gain the attention of an potential customers and audience at outdoor events, fairs, and expos. 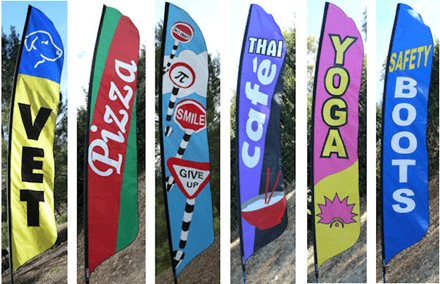 The addition of these promotional teardrop flag banner, results in a colorful and festive atmosphere. 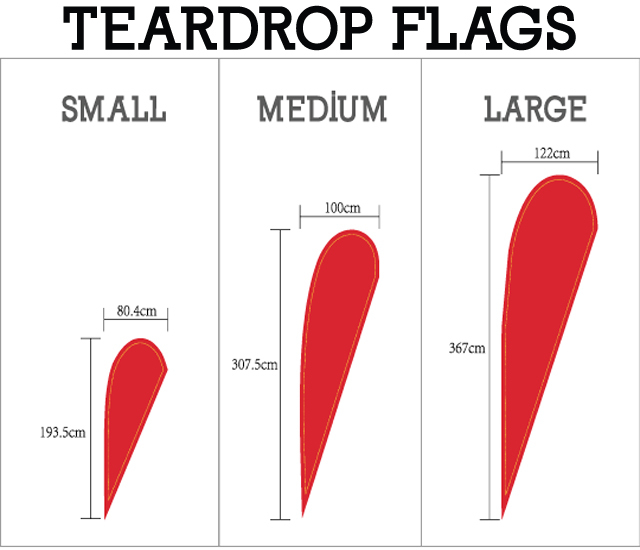 Why Are They Called Teardrop Banners And Flags? Well simply put, unlike feather flag, they are shaped like teardrops. Like feather flag, promotional Teardrop flag banner are mounted on poles, in the same manner as other types of promotional flags. The banners themselves normally contain piping around the edges for strength and durability. Its very important to ensure that the pole is threaded through the piping to the end of top pole and to where there is a length of reinforced material for longer lasting resistance to wear and tear. Also ensure the rubber anti cut grommet is in place at the tip of the top pole. 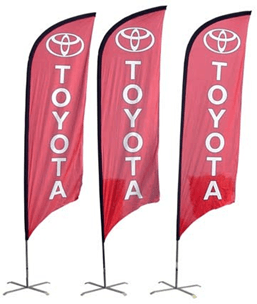 Sometimes people also refer to these promotional flag banner as “flying banners” because of how they seem to dance around in the wind. 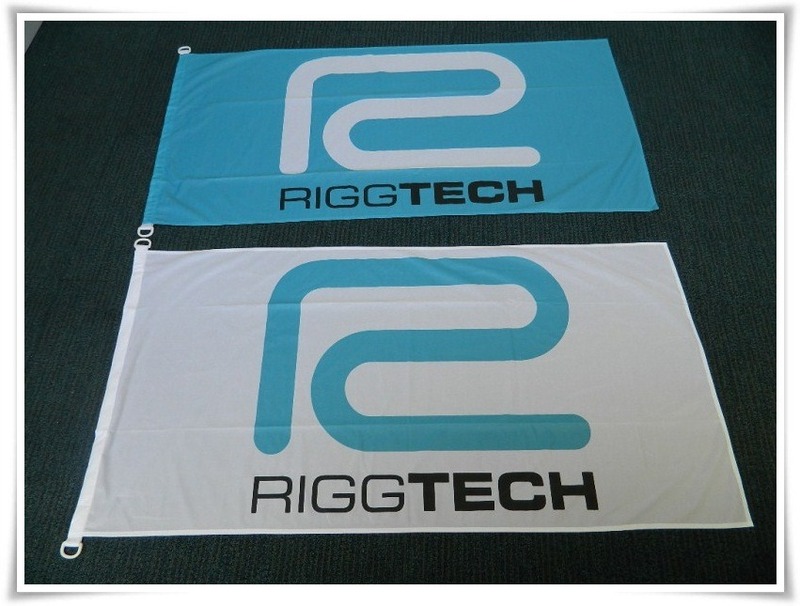 To maximize the effect it’s a good idea to purchase promotional Flag banner of various sizes. 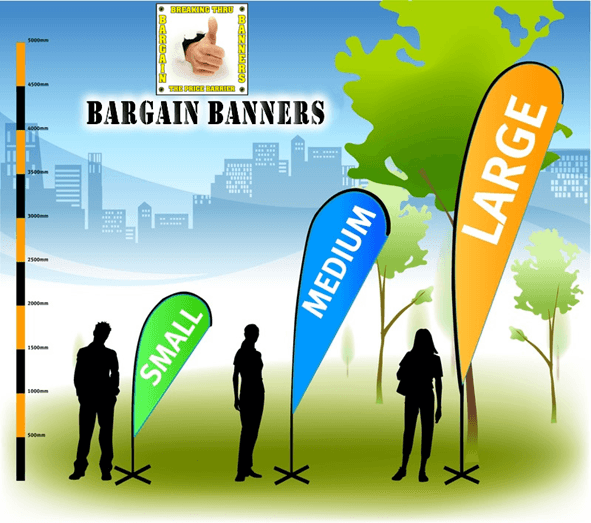 Pricing can greatly vary depending on flag banner quantity. You should always expect to pay more for a quality product. We offer a discounted price if you purchase more than one. 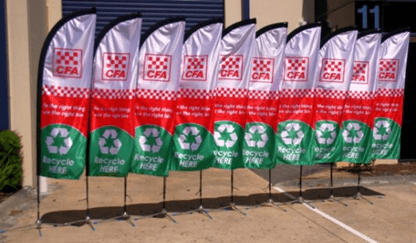 The price of Promotional Flag banner is only $220 plus GST for a small 2.5 m Flag with spike base, carry bag, free artwork design and free delivery , truly great value. Cross bases are $60.00 extra, due to their sturdy construction and weight, water or sand bags are also available on request at only $15.00 extra, buy 2 or more and they are free. This price is extremely competitive, as we also make all our flags with DOUBLE SIDED prints, that’s 3 layers of material, with print on both sides, and a block out layer in the middle, the artworks on each side can be different, at no extra cost and supplied with the very best quality bases and poles on the market. Promotional Feather flag banner are an affordable, unique and popular option for advertising to customers or attendees to a special event. A particular favorite of Auto re sellers and car yards. Bargain Banners is a major supplier of the Macquarie Finance Group, and all the Ford Flags banners, you see in car yards across Australia are ours, further proof of our commitment to quality and value. 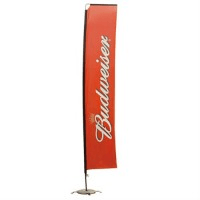 What Are Promotional Feather Flag Banner Made Of? The promotional flag banner are constructed of a durable and lightweight fiberglass pole and the flag material, is a denier nylon weatherproof material that flows easily in the wind. The fabric can be screen printed in full color (CMYK 4 color process) and the messages are large enough to be seen clearly from 100m or more. Promotional Feathered Flag banner can be custom made from 1 meter, up to more than 5 meters (or higher). The fabric slides onto poles, which are placed on a base that also have an added feature, they spin on a ball bearing turnbuckle., which takes a simple banner and turns it into a kaleidoscope of color and motion. Promotional Feather flag banner are a very effective, attention grabbing and attractive visual display, that are easy to construct, extremely affordable and versatile in the various ways they can be displayed. When several flags banners are grouped together, they quickly grab the attention of onlookers and those milling around an event. The designs are digitally created, so the possibilities are endless and all our artwork is free of charge. 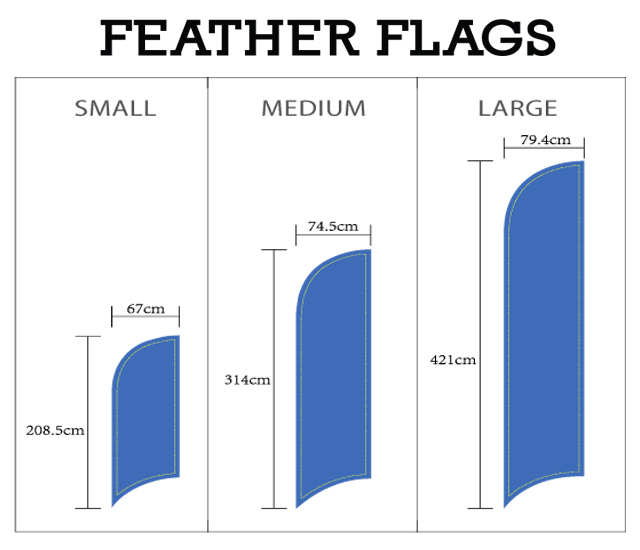 What Are Standard Feather Flag Banner Sizes? 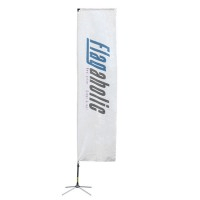 Feather flag banner can range anywhere from a smaller version of 1.0 m high to huge banners over 5.0m high. HOW LONG DO FEATHER FLAG BANNER LAST? Since most feather flag banner are typically used outdoors, in the sun and wind, they may start to fade or fray around the edges in as little as 6 months with constant outdoor use. Since the climates of regions vary widely, we can not guarantee beyond 6 months, if you experience significant fading within this period, we will consider free replacement. Various inks are available, with differing UV resistance, light colours fade faster than dark colours, there is more pigment in dark colours, but even the most expensive inks, fade and no ink manufacturer will give guarantees beyond 12 months, we use Italian inks mostly, however If you are only using these banners on special occasions, seasonally, taking it down during bad weather and extreme windy conditions, your banner will last for a long time. Once you have purchased the base. pole, etc. You can also just order the replacement flag, with a new design should you need too as this is very economical. 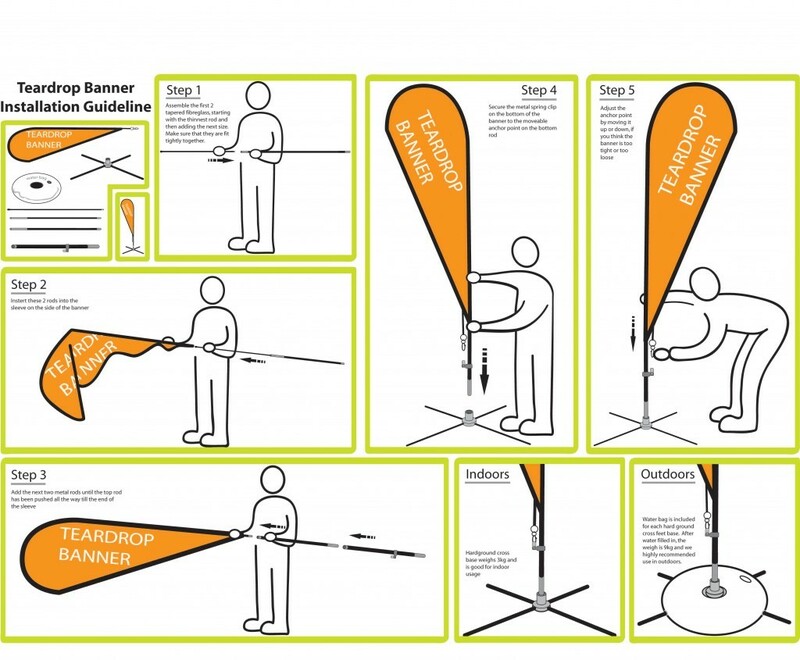 How Much Do Feather Flag Costs? Pricing can greatly vary depending on quantity. You should always expect to pay more for a quality product. We offer a discounted price if you purchase more than one. Our price is only $220 plus GST for a small 2.5 m Flag with spike base, carry bag, free artwork design and free delivery , truly great value. This price is extremely competitive, as we also make all our flags with DOUBLE SIDED prints, that’s 3 layers of material, with print on both sides, that can be different, at no extra cost and supplied with the very best quality bases and poles on the market. No competitor in Australia can beat our prices for the quality of flag banner and hardware used. 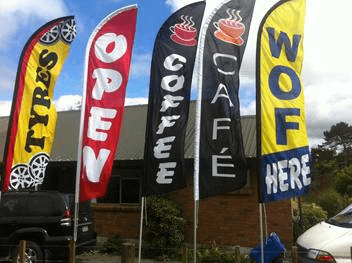 Drop flag banner are an affordable, unique and a popular option for advertising in front of shop fronts and around sporting venues. With their bright colors, these types of displays can achieve an eye-catching effect. their rectangular shape does provide a large advertising surface area. What Are Drop Flag Made Of? The flag banner are constructed of a durable and lightweight polyester and aluminium. The flag material, is a denier nylon weatherproof material that flows easily in the wind. The fabric can be screen printed in full color (CMYK 4 color process) and the messages are large enough to be seen clearly from 100m or more. A single Drop flag banner can hang be custom made from 1 meter, up to more than 5 meters (or higher). The fabric slides onto aluminum poles, which are placed on a base that also have added feature, that spin on a ball bearing turnbuckle., which takes a simple banner and turns it into a kaleidoscope of color and motion. Drop flag banner are very effective, attention grabbing and attractive visual display, that are easy to construct, extremely affordable and versatile in the various ways they can be displayed. When several flags are grouped together, they quickly grab the attention of onlookers and those milling around an event. 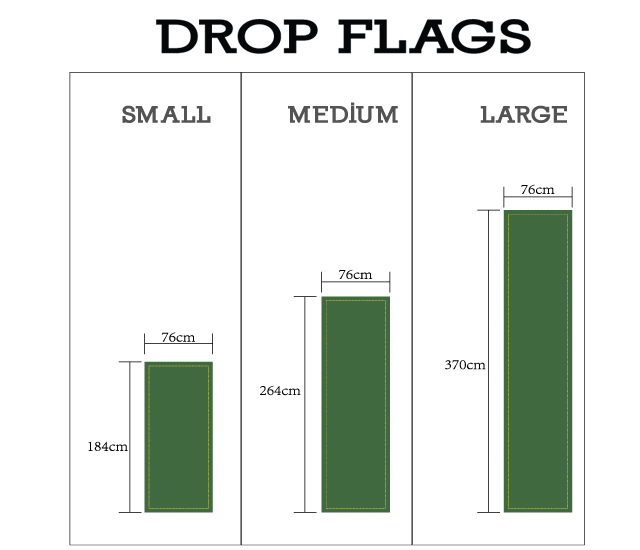 What Are Standard Drop Flag Sizes? Since most Drop flags banner are typically used outdoors, in the sun and wind, they may start to fade or fray around the edges in as little as 6 months with constant outdoor use. Since the climates of regions vary widely, we can not guarantee beyond 6 months, if you experience significant fading within this period, we will consider free replacement. Once you have purchased the base. pole, etc. You can also just order the replacement flags, with a new design should you need too as this is very economical. Bases have added feature, they allow spin on a ball bearing turnbuckle., which takes a simple banner and turns it into a kaleidoscope of color and motion. How Much Do Drop Flag Cost? and as above, includes spike base, carry bag, free artwork design and free delivery , truly great value, buy 2 or more and we discount accordingly. Custom made flags banner any size to suit flag pole any design, we can create for you for free. *eg. this one is 1.4 x 0.7 for only $100 each plus GST, min order 2 only.